Are you ready to get started with Seamless Piecing? I hope you love this new technique like I do. If you don't love it, we can still be friends. I'm cool that way. There are no relevant photos on today's post. I threw in some cat photos so you don't get bored. You are welcome! There are links to everything so if you need to know what something is, or where to get it, or what hints to leave for Santa, it's just a click away. Basic rotary cutter and mat - I use an olfa cutter because generic blades will fit in it. Acrylic rulers - Usually a basic ruler used for rotary cutting will be sufficient. However, a quilting ruler is more than a simple straight edge. That's not to say you need a bunch of gadget-like rulers. Some specialty rulers may be handy, but most are expensive and not necessary. There are some quilty things that simply require a certain ruler. We'll talk about those as the need arises. A firm, flat pressing surface - Spongy surfaces will distort your pressing, making your lines look crooked. Yuck! Anytime I'm using starch I use a separate pressing board made from the bottom of an old drawer topped with some cotton batting and white duck cloth. I don't want starch burns on my cute ironing board cover. Yuck again! I'll tell you how "I" (meaning my sweet Hub) made my pressing board in another post. A hot, dry iron - I use the Wedge Iron by Clover. There are no holes in the bottom to crinkle up your corners. It comes on sale at Amazon or Craftsy for under $30 if you are patient. A guide foot for your sewing machine, sometimes called a Stitch in the Ditch foot. This is optional but you can get one for just a few dollars on Amazon and it's absolutely worth it. This is great for any kind of topstitching. 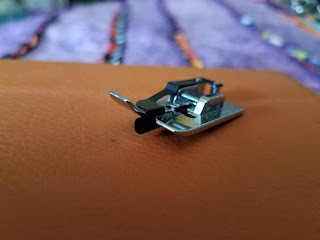 I use it for sewing bindings onto quilts and any other seam that will show. It creates the illusion that I can sew in a straight line. Elmer's WASHABLE school glue 4 oz bottle I've been using my 50 cent bottle of glue for over a year and I still have 2/3 of the bottle remaining. To wash the glue out of the finished quilt, soak for 10 minutes in cold water, then launder as usual. Microfine Glue tips: the only place I know to get these is from Sharon Shamber. Look around Sharon's site and videos. She is a master quilter and my technique is a stepchild of her glue baste technique. I recommend ordering your glue tips right away. It will take a while for them to arrive. (yep, I've been spoiled by Amazon prime. Anything over 2 days is a while.) We'll use them in nearly every project. I'll share a temporary work around so you can sew along while you are waiting for your glue tips to come in the mail. Tip: Did you know washable school glue is Spray Starch concentrate? Put some in a spray bottle filled with water and... there you go! Super cheap spray starch. You can make it as heavy or light as you like. Shake well to distribute each time you use it. To wash it out of your quilt, let the project soak in cold water for 10 minutes then launder as usual. Templates: Required templates will be listed in the individual patterns. Most of them can be made from good cardstock or light cardboard (cereal boxes). If you love the technique, make them reusable from no-melt template plastic. Label them with permanent sharpie marker so you don't have to make them twice. Some templates will have to be purchased. Sorry. I'll try to keep that to a minimum. In addition to my good old ironing board and steam iron that I've had for over 35 years, I also have the June Taylor Cut and Press II double sided mat which is very convenient because I can store it standing up, and use it in front of the TV. If I did much traveling, I'd love to have the Omnigrid fold away portable cutting and pressing station which folds to protect both surfaces. It's on my wish list - both the travel and the cut/press station. That's it. Nothing too fancy. You probably have everything except the WASHABLE school glue and the glue tips. So what are you waiting for? Get them ordered! Next week's skill builder post will give you a head start on the FREE Thanksgiving project pattern. It's super cute. You won't want to miss it. Before you go, click FOLLOW. If you have questions or suggestions, leave them in the comments below. You can also contact me directly by email at RB.seamlesspiecing@gmail.com. I am new and need a little more help with the applique' process. Help me understand what the different "tips' that you talk about are used for. These are microfine glue tips. They replace the regular tip of a 4 oz bottle of WASHABLE school glue. Using them gives you a tiny bead of glue that will hold your fabric without gobbing up or seeping through. There is a link to Sharon Shamber's site in the post. You can order them from there. Good luck. I know you'll LOVE using them.